Enlarge / PARIS – APRIL 15, 2019: Emergency services tackle a fire at Notre-Dame de Paris, a Catholic cathedral founded in the 12th century. After a long night of work by over 400 Paris firefighters, the fire at Notre Dame Cathedral is beginning to cool as of 7:00pm Eastern Time (1:00am in Paris). We're still not sure about the extent of the damage, but as Paris and the rest of the world watch the fire slowly dying, attention starts to shift to what can be salvaged and rebuilt. And art historians and architects have incredible records of the cathedral, which has been damaged, rebuilt, nearly abandoned, and renovated many times throughout its long history. Notre Dame's roof and its support structure of 800-year-old oak timbers had almost completely succumbed to the flames. 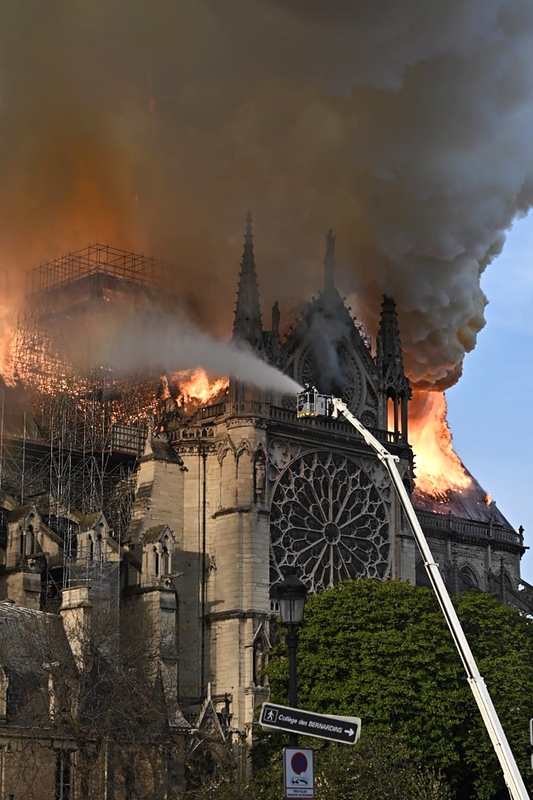 Firefighters reported the cathedral's bell towers safe and said that many works of art had been rescued or were already stored in areas believed safe from the fire. The main spire—750 tons of oak lined with lead—collapsed in flames around 2pm ET, landing on the wooden roof. The trees that made up the roof's wooden structure were cut down around 1160, and some sources estimate that the beams accounted for 13,000 trees, or about 21 hectares of Medieval forest, many of which had been growing since the 800s or 900s. “You have a stage in France where deforestation was a problem; these buildings consumed huge amounts of wood.” That's according to Columbia University art historian Stephen Murray, who spoke with Ars Technica. All that wood, he said, supported an outer roof of lead—until the wood burned and the roof collapsed. “The entire roof is destroyed; I hope the vaults can resist,” reads an email from one of Murray's colleagues in Paris, which he was kind enough to share with Ars Technica. The high vaulted stone ceilings give the cathedral an open, cavernous feel and perfect acoustics for religious services, but they were also built to help protect the interior of the cathedral from an event exactly like this one: the collapse of a burning roof. Some reports this afternoon suggested that furniture inside the cathedral was burning, which (if correct) wouldn't bode well for the vaulted ceiling. Much now depends on whether it also damaged the columns that support the body of the building. In a statement, French Prime Minister Emmanuel Macron vowed to the rebuild the cathedral, beginning with a national donation program to raise funds for the effort. It's clear that reconstruction at Notre Dame will be a massive undertaking, but its exact scale depends on exactly what's left behind when the fire finally dies away. While architects have enough detailed information about the cathedral to pull off a technically very precise reconstruction, the craftsmanship is unlikely to be the same. Today, the stone that makes up the cathedral would be cut using machinery, not by hand by small armies of stonemasons as in the 12th century. “Nineteenth-century and 20th-century Gothic buildings always look a little dead, because the stone doesn't bear the same marks of the mason's hand,” Murray told Ars Technica. Entire forests of 400-year-old oak trees to replace the roof timbers will inevitably also be nearly impossible to come by, so it's likely that Notre Dame will never be quite the same. But, at least in the immediate aftermath, there appears to be a will to rebuild, and Murray notes that France has a large historical restoration industry. “There are companies very, very well equipped to take this sort of thing on,” he told Ars Technica. PARIS: Flames and smoke are seen billowing from the roof at Notre Dame Cathedral April 15, 2019. A fire broke out on Monday afternoon and quickly spread across the building, collapsing the spire. The cause is yet unknown but officials said it was possibly linked to ongoing renovation work. PARIS – APRIL 15, 2019: Emergency services tackle a fire at Notre-Dame de Paris, a Catholic cathedral founded in the 12th century. Smokes and flames rise during a fire at Notre Dame Cathedral in central Paris, France, on April 15, 2019. PARIS, FRANCE – APRIL 15: Flames and smoke are seen billowing from the roof at Notre Dame Cathedral on April 15, 2019. PARIS, FRANCE – APRIL 15: Flames and smoke are seen billowing from the roof at Notre-Dame Cathedral on April 15, 2019. Seen from across the Seine River, smoke and flames rise during a fire at the landmark Notre-Dame Cathedral in central Paris on April 15, 2019. PARIS – APRIL 15: Flames and smoke are seen billowing from the roof at Notre-Dame Cathedral April 15, 2019 in Paris, France. And renovators will have a remarkable amount of information to work with, although no original plans of Notre Dame Cathedral exist. A couple of centuries after Notre Dame's construction, other building projects left behind documents called building accounts or fabric accounts, which include information like materials purchases and payments to masons. But in the late 12th century, written documents weren't yet widely used. “For cathedral construction, those records very often, even if they existed, were discarded because they were not considered to have any permanent ongoing value,” Murray told us. In the early 1800s, after Victor Hugo's novel The Hunchback of Notre Dame had drawn Parisians' attention back to the cathedral, which at the time was crumbling and falling out of favor, architects Eugène Viollet-le-Duc and Jean-Baptiste-Antoine Lassus received a royal contract to restore the Medieval structure. Working with relatively simple tools, he still left behind detailed, accurate drawings of the original architecture and his own restoration work. Two hundred years later, Murray and the late architectural historian Andrew Tallon of Vassar College carried laser scanners through the entire cathedral, including the space above the vault and several out-of-the-way spiral staircases, passages, and other hidden spaces. The scanner used laser beams to measure the distance between the instrument and a point on the wall, floor, or ceiling of the cathedral. By the time they finished, the historians had measured distances between over a billion points in Notre Dame, and their measurements were accurate to within about 5mm. Tallon mapped those points to panoramic photos to create detailed three-dimensional reconstructions of the cathedral. The recent fire is the worst damage Notre Dame has suffered so far in its history, but it's not the first: the cathedral has an 800-year history of remodeling, damage, and rebuilding. Its life is an order of magnitude longer than ours, and in a couple of centuries, the tragedy of today's fire may be another part of the long story woven into the building's fabric. Louis XIV and his son Louis XV had it drastically remodeled in the 17th and 18th centuries. In 1786, architects removed the original spire after centuries of wind had weakened its oak frame. During the French Revolution, revolutionary forces destroyed most of the statuary, and the cathedral was rededicated to the atheist Cult of Reason and the deist Cult of the Supreme Being (a pet project of Maximilien Robespierre). Napoleon returned the cathedral to the Roman Catholic Church after his rise to power in 1801, but 30 years later, Notre Dame had fallen into disrepair, and many Parisians regarded it as a crumbling old eyesore. But The Hunchback of Notre Dame transformed the sorely neglected cathedral into a beloved Paris landmark again. It launched Lassus and Viollet-le-Duc's 25-year process of restoration, which included reconstructing the spire that collapsed in the April 15 fire. Using Camper Mode in the Tesla Model S P100D to Power House during Hurricane Irma Power Outages?